The maintenance hallways of the station are littered with exposed wires, pipes, crates, and many useful items. (Even that space fungus on the wall can be put to a good use if you are resourceful.) It is dark and has few windows, making it useful for hiding bodies, items, and dark horrible secrets. A good place to kill people and be killed, a good place to mug and be mugged. Also useful for entering security, EVA, and other high-security areas without letting the opportunistic raider bust in and steal everything. Or, if you are an opportunistic raider, they are a good way to break into high-security areas without being seen. Something not always true but pretty useful to know is that most traitors won't waste a bomb on or set fires to maintenance areas. if you aren't sure what areas are still intact, take the maintenance route instead. This is also pretty useful for events like kudzu, where higher traffic and easier to access areas like most hallways are going to be cut off. Maintenance level access is weird. 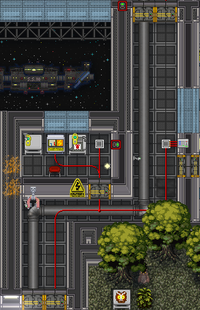 It's intended for the use of the lowlier station fodder such as janitors and engineers, while some more prestigious professions such as scientists don't get access. This page was last modified on 1 January 2019, at 16:39.